In this section I will cover the basics of how to do Pilates and the kinds of equipment and accessories that are required for doing the Pilates workout. Have you ever wondered how Pilates got its name? Back in 1965, a man by the name of Joseph Pilates announced that at his age (86) he never needed aspirin and hadn’t ever received an injury during his life. He claimed it was because of the exercises he had been doing and figured that everyone would be happier and healthier if they did them too. His original book is still available after all these years (click the book cover images >>> to read the details) and the practitioners of Pilates workouts keep growing every year. In addition to enjoying a near pain-free body, there are other Pilates benefits to be gained too. Since Pilates focuses on the body’s core muscles, those who do it often become more conscious about their bodies. For instance, they will begin to feel the difference between good posture and bad posture. Some are even able to pinpoint the area of their body that’s causing them discomfort and fix it. Pilates works various muscles by stretching them, in addition to working them, which enhances overall flexibility of the body. The stretches done in Pilates also helps relieve back, shoulder, joint and neck pains as well! As the body begins to get stronger and muscles are stretched through Pilates, circulation is believed to increase as well. Therefore, Pilates is an excellent way to achieve this health benefit. Pilates takes an ample amount of concentration in order to perform the movements correctly. This concentration takes the focus off of the outside issues one is facing, which results in relieving stress. Once one is finished with his/her Pilates workout, they are generally peaceful as the exercises in Pilates also eliminate the side effects stress has on the body, which is great for the body’s overall health. It’s sad but obesity in children is on the rise, causing major concern among health professionals around the world. Other growing problems that children are dealing with today don’t necessarily have anything to do with being overweight, but are still major issues. These include allergies, asthma, autism and other ailments. You may find it surprising, but Pilates can actually help with all of these problems, and many more. Many people consider children who are unable to sit still as having an attention disorder. While this may or may not be true, Pilates can help children sit still longer. How? Pilates focuses on strengthening the core muscles of the body, and when a child has a strong core, he/she will find it much easier and more comfortable to sit still…meaning they will sit still longer. Pilates is not an intensive form of exercise, but it can help children manage weight. How? Well, it’s activity for one…which means your children will be exercising and not sitting in front of a TV or computer. Secondly, the exercises of Pilates will help children burn fat and build/tone muscles which will help them lose weight and get fit. Pilates focuses on the muscles we use most often, every day. Therefore, children who participate in a Pilates workout program on a regular basis will naturally be able to better manage their weight. The majority of children think that in order to get exercise, they have to join a team sport at school, which can be intimidating for a lot of kids. Additionally, some kids just don’t enjoy sports like others do. Pilates is a great solution for this problem as it can be done alone, while at home and is perfect for all body types. Therefore, children who want to be physically active without participating in a group sport/activity, can easily do Pilates and reap all of its health benefits. One thing that many children don’t pay attention to is their body and the positions they put their bodies in every day. However, when a child is involved in regular Pilates exercises, he/she is going to be paying attention to their body and any bad habits (slumping, raising shoulders, etc.) that they may be doing. This is great because it will last a lifetime and when people utilize proper body positions, they generally feel better and lead more healthy/active lives. Another great benefit children gain from Pilates is learning how to better control their bodies. Pilates teaches people how to use controlled breathing techniques that can help with nervousness, asthma and other common ailments. The controlled exercises of Pilates can also be a great outlet for children with destructive tendencies. As you probably know, it’s important for everyone to exercise even senior adults. However, many seniors are concerned that exercising may cause them injury, which may actually happen if they participate in high-impact workouts. However, seniors can still get the daily exercise they need with a low-impact exercise program such as Pilates. Pilates focuses on strengthening core muscles and stretching the spine by using very slow and deliberate exercises/positions that are gentle and low-impact, making them perfect for seniors. A lot of doctors recommend seniors give Pilates a try because of its low-impact nature, but also because Pilates has been found to help relieve pain caused from various health issues such as arthritis, former injuries, etc. Below are some additional reasons why seniors should consider Pilates. Because Pilates focuses on the core muscles, many important body muscles are strengthened as a result, which dramatically reduces the chance of injury for seniors. Additionally, as seniors progress through Pilates, they will notice enhanced flexibility within their body which also helps prevent injuries from occurring. As we age, out blood circulation becomes increasingly more important as circulation disorders can cause frustration, injury and even death. Pilates is one of the best exercises for seniors to do to encourage healthy circulation as it relaxes the muscles and gets the whole body working. The problem with many exercises for seniors is how hard they can be on the joints. The movements and positions used in Pilates are low-impact and very gentle, putting very little stress on the joints. This is very helpful for seniors, especially those who have arthritis. In fact, Pilates can actually help reduce the inflammation caused by arthritis when done correctly on a regular basis. Thought Processing – Pilates has been reported to help seniors with their thought processing skills (mental clarity) and reduce the amount of forgetfulness/confusion that can accompany senior adults. Another major issues seniors face is losing bone mass over time. Since Pilates doesn’t require a lot of strenuous activity, it may actually help prevent excess bone loss. Finally, many seniors who regularly do Pilates enjoy how energetic they feel afterwards. As previously mentioned, the movements are slow and deliberate, which not only works many muscles, but it also relaxes and energizes as well! Many people look for more than just muscle toning and strengthening from an exercise program. They want to help reduce their stress level and improve their overall wellbeing. Pilates will help one achieve both of these things. It was developed in the 1920s by a German named Joseph Pilates. He had a number of physical problems and created a variety of exercises that helped him improve his wellbeing. He eventually had the goal of sharing his exercises with others to help them achieve the same lifestyle as he had. While Pilates does improve muscle flexibility and strength, it also reduces stress. So, how exactly can Pilates help reduce stress and improve overall wellbeing? If you or someone you know suffers from chronic pain, then you know how much stress this add to your life. Joseph Pilates had a number of physical ailments, but claimed that because of his exercises he never needed an aspirin and neither would anyone who did his exercises. Pilates helps lengthen the spine, improve core muscles and align the body, which helps explain why it works at relieving bodily pain. For instance, did you know that chronic pain can be caused by a misaligned body? Pilates helps correct this problem and prevent it for those who haven’t gotten out of line yet. And, when your body is aligned, you feel better which means you aren’t nearly as stressed! Healthy blood circulation helps a number of health related problems such as high blood pressure, heart disorders and many more. Pilates has been known to improve the blood circulation throughout the body, which reduces a number of issues including stress! As Pilates helps stretch out the muscles and strengthen them, it also “stretches” out the stress absorbed by your body throughout the day. This will leave you feeling flexible, stronger and stress-free at the end of your Pilates workout as you will have effectively relaxed your muscles. Additionally, when you have a strong, flexible and relaxed body, your attitude will reflect this too! If you’ve been paying attention to the recent trends in exercise, you’ve probably noticed the rising interest in Pilates. This is a great form of exercise as it promotes muscle strength, flexibility and balance. However, there are some rules that should be followed by those who wish to do Pilates while pregnant. If you are pregnant then you should be seeing a doctor on a regular basis and you should get his/her opinion regarding your pursuit of Pilates during pregnancy before you start. Many women are able to do Pilates while pregnant, but some aren’t due to certain circumstances. Therefore, always take your doctor’s advice regarding this matter before you begin. Pregnancy causes your stomach muscles, and many more, to stretch naturally. Therefore, take it easy on your muscles and stretch in a gentle manner when performing the various moves/exercises of Pilates. * Look Into Pre-Natal Pilates Classes. If you’ve never done Pilates before, then you should check into pre-natal Pilates classes. These classes are designed for pregnant women and will keep you and your baby safe during the exercises. If you don’t have a local pre-natal Pilates class available, then look online for an instructional DVD. * Work on the Core. When it comes time to push your little one out of the womb, you’ll be using core muscles you didn’t know existed. Therefore, prepare for this with Pilates by working the muscles of your pelvic floor, abdomen and lower back to make labor an easier process. Another important technique you’ll need to master during labor is breathing. Pilates can help a lot with this, if you work on it. Therefore, focus on specific breathing techniques while performing Pilates. Pilates involves a lot of difficult exercises and requires a lot stretching. Therefore, make sure you don’t overdo it. You don’t want to stretch too hard or else you can cause more pain and harm to yourself and your body. * Allow Your Breath to Get Out of Control. Sometimes it can be hard to determine what is a good workout level, especially during pregnancy. One of the best tests is suggested by many experts. Basically, experts believe that as long as you’re able to talk normally (no panting or gasping) then you’ll be okay. * Do Balance Exercises Alone. As your baby continues to grow inside of you, you’ll begin to notice that your sense of balance also changes. Therefore, when doing Pilates, refrain from balance exercises unless you have someone present to help you if you need it. * Hold Yourself to the Same (Prenatal) Standards. It’s important to understand that your body is undergoing a lot of changes now and you will not feel or look like you did before pregnancy. So, don’t expect to. Pilates vs Yoga - What are the Differences? Many people get Pilates and Yoga confused as the exercises seem to be similar and so does a lot of the equipment. However, there are differences between Pilates and Yoga and it is important that you understand these differences to ensure you pick the right exercise workout for you. Yoga has been around for a very long time, for several thousand years, in fact. It originated in India and was often (still is for some) believed to help one achieve a higher spiritual state. Because of its religious background, it was not created for everyone or even as a form of exercise. However, Pilates, on the other hand was. Joseph Pilates unveiled his unique form of exercise in the 1920s, when he was 86 years old. He wanted to help everyone experience the pain-free lifestyle he was living and believed his unique exercises were the answer for it. While many believe that Joseph Pilates based many of his exercises off of those used in Yoga, Pilates has never been considered a form of Yoga. Why? Pilates is designed to target the core muscles whereas Yoga doesn’t focus on any one group of muscles and works all muscles equally. Additionally, Yoga doesn’t use specialized machines either. Another difference between Pilates and Yoga is the equipment used for each. 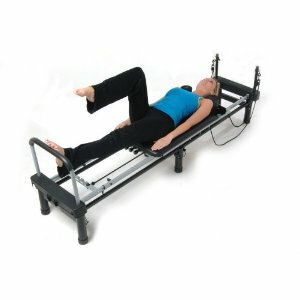 Pilates has a lot of specialized machinery to assist people in achieving the right positions. However, Yoga has no such machinery. All Yoga uses for its exercises are a few props such as wood blocks, an exercise ball, blanket and a mat. Finally, Pilates was designed to help people get in shape and live as pain-free of a lifestyle as possible. In contrast, Yoga was designed to help people become more spiritual and focuses on your overall lifestyle as it incorporates exercises and meditation together. As you may already know, Pilates and running are two completely different types of work-outs. Pilates is low-impact and slower paced, whereas, running is fast paced and high-impact. Because they are different types of exercises, they complement each other pretty well. Here’s how. Pilates focuses on a number of things, one of which is posture. The slow, repeated exercises done in Pilates allows you the ability to focus on your body’s posture and alignment, which will help you to move (and feel) better. Running is a great exercise, but can be harmful when done while using bad posture…Pilates helps correct this problem. Running requires a runner to have strong abdominal, back and other core muscles to prevent injuries. Pilates focuses on these muscles and will therefore help you reduce the chances of injury while running, which will also help you get the most out of your daily runs too. Because Pilates is involves the practice of many slow and deliberate exercises, it will teach you to be more aware of the overall condition of your body. You’ll be able to feel when something isn’t quite right with your body. This is a valuable tool for runners. If you don’t feel right and “write” it off as just a little “ache” you could actually injure yourself during your run. Running is about more than just putting one foot in front of the other in a quick manner, it also involves breath management. Pilates helps runners improve their breathing in both function and overall lung capacity. While running mostly targets the core muscles, Pilates actually works all of your muscles. This is important because all muscles need to be worked in order for a workout routine to be effective. In addition, when you are able to work your entire body through Pilates, you’ll also be reinforcing what muscles are targeted while running, which will improve your flexibility and reduce the chance of enduring a running injury. Weight loss is a topic many of us have in common…it just seems like so many of us are constantly struggling to reach our “goal” weight. If you are looking for a new exercise routine that will aid you in losing weight, then Pilates may be for you. Below are a few ways that you can use it to help you reach your weight loss goals. When trying to lose weight with Pilates, it’s best to combine these exercises with another form of exercise like bicycling, walking, swimming, running, etc. Obviously, you won’t do these at the same time, but you should do some cardio-intensive exercises on your “off” Pilates days…or even in the morning/evening when you aren’t doing Pilates. Regardless of what type of exercise you do, you will burn calories. However, if you want to burn more calories with Pilates, you should add some wrist or ankle weights while exercising. Another great thing to do with Pilates when trying to lose weight is to increase the speed of the exercises/repetitions you are doing. The traditional tempo of Pilates is slow and deliberate, but when you speed it up you will aid your weight loss efforts. This sounds a little odd, but your body will be more effective at burning calories when it is positioned properly throughout the day. Therefore, begin focusing on the manner in which you sit, stand and walk to burn the maximum amount of calories possible. Many people do Pilates two or three times a week, which is great, but if you want to lose weight, increase your weekly frequency of Pilates. If you don’t think you can handle doing it every day, then do another type of exercise on your “off” days. This same principal can also be applied to your workout length. Instead of doing them more often, just increase the amount of time you spend working out on the days you do Pilates. One thing Pilates does is help you strengthen/build your core muscles, which according to the experts, helps you burn more fat. Therefore, concentrate on stretching and toning your muscles between and during workouts. Pilates can be a very fun and rewarding form of exercise to do from home, but as with most home exercise programs, there is some recommended equipment that you’ll find helpful. Below are the items you may need before you begin your home Pilates workouts. This is essential for anyone who does Pilates, whether it’s at home or at the gym. 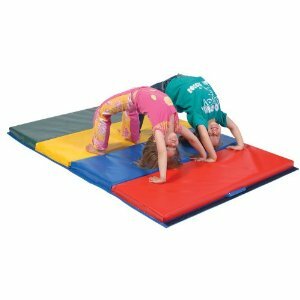 The reason why you will need a floor mat is because it provides you with a little extra comfort as you do some of the “floor” moves and it also helps gives you the grip you need to perform some of the positions required. 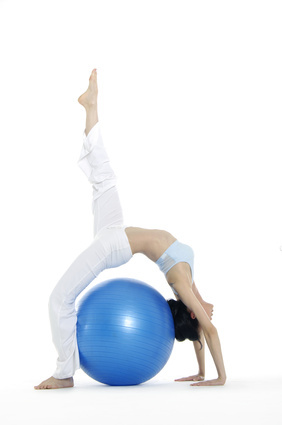 More than likely you’ve seen a stability ball before…they’re those big round “bouncy” balls you see at the gym. They have a ribbed exterior and help you focus on your core muscles designed to improve balance and keep your body’s core strong. If you are unable to find (or afford) a stability ball, you can opt for a foam roller, however these are more challenging than the stability balls are. Although resistance bands were not intended to be used with Pilates, originally, many people find them helpful additions to their workouts. They are stretchy bands (resembling big rubber bands) that are strong and provide a lot of resistance to help make certain positions more challenging while strengthening important muscles. This odd piece of equipment is also known as a “trapeze table” because of the way it looks. Basically it’s a cushioned bench (leather) that has a metal canopy frame, which has a variety of springs and straps hanging from it. 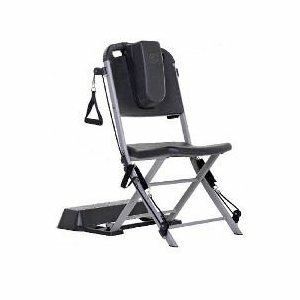 There are a number of Pilates exercises that can be done with this piece of equipment. 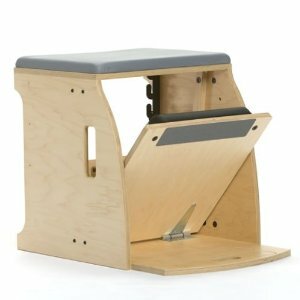 This unique “chair” is used to increase the resistance of select Pilates exercises. It looks like a wooden box with several sides “topped” with leather cushions. You will sit on the top of the box and pull a “shelf” out from below, which acts like a pedal. 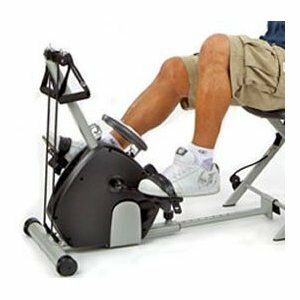 When you push the pedal down with your legs, you’ll quickly find the springs below to be quite resistant, which will strengthen and tone your leg muscles. Reformers are made from wood and are designed to strengthen the upper body, especially your abdominal section. Some are made to be foldable, which you may find more convenient for home use as they’re easier to store out of sight. A reformer looks like rowing machines combined with a low bench that you find at gyms. These are very useful when doing Pilates as they not only work your upper body, but they also work your legs and buttocks as well. Pilates is not a form of exercise that you should start without some type of instruction. Therefore, if doing it from home, you should find an informative DVD to help you learn how to do Pilates on your own. Depending on the workout DVD you choose, and your budget, you can decide which pieces of equipment you will need. There’s always a little bit of fear when starting something (like Pilates) for the first time. It can be intimidating, especially if you are unprepared. Therefore, if you’re going to start Pilates for the first time, you will want to read through the checklist below. 1. Pilates Workout Groups – Many first-timers get their start in Pilates by taking a group class where they can learn with others. To decide if this is the route you want to take, ask to sit in and watch a class at your local gym before you sign up. a. Good communication skills to ensure you understand the directions given. d. Ability to do the exercises with the class. When you are able to sign up for Pilates with an instructor who has the above qualities, you will feel motivated and excited to get in and get started. Therefore, take a moment to look at the students in the class to see if they seem to be enjoying the class. Also, watch to see if the instructor corrects students who are having difficulty with the exercises too. 2. Home Workouts for Pilates – There is nothing wrong with doing Pilates on your own from home if you are unable to attend a class, or are uncomfortable with working out with a group. However, make sure you look for a DVD program that has a lot of good reviews and fits your level of skill. You can also add to your workout by researching routines and Pilates tutorials on the internet too. 3. The Equipment – There isn’t a lot of equipment needed for Pilates. In fact, you really only need a floor mat and yourself to get started. 4. Clothing – You will need to purchase some well-fitting exercise clothing for Pilates to ensure that your instructor is able to check your posture and muscle form so he/she can help you get the exercises right. So, stay away from baggy clothing and super-tight clothing. Aim for clothing that fits comfortably and is maybe on the “stretchy” side. 5. Expense – Like all things, it does cost a little to participate in Pilates. Even if you are doing it from the comfort of your home, you are probably going to be out the expense of buying a floor mat and finding a good DVD. Of course, the cost will go up if you decide to purchase some of the Pilates home equipment available. If you choose to take a Pilates class, you’re probably going to be paying roughly $15-$30 per class. However, every gym is different and each run their own specials and some even have packages available. Therefore, you may have to contact various gyms to find the best deal in your area. Whether you choose to exercise at home or would rather go to a gym, you owe it to yourself and your family to find out if learning how to do Pilates is a good fit for your family. Here is a selection of Pilates equipment, workout accessories and DVD's that I will feature so that you can do some window shopping and compare online to save money. Just click on the image to get more details about the product. If you are a blogger looking to find brand new exclusive Pilates PLR articles and content, along with some pre-sized Pilates graphics ready for you to just upload on your blog or to use for marketing on PinInterest, then you have found your ideal pack here. I have even included a list of the 100 most profitable Pilates keywords with the least competition to help you rise in the SE rankings. And you get all this for a bargain price of only $4.50 - get it now! I hope that you found the how to do Pilates for beginners helpful and that you will find good use for it. There are many resources online that can also show you how to do Pilates for abs as well as how to do Pilates at home. There are many differences between Pilates vs Yoga although the philosophy of a well balanced Pilates workout definitely is well aligned with the health benefits of yoga. So when you consider learning the best how to Pilates exercises you should consider including some yoga postures as well. These how to do Pilates contents are solely the opinion of the author and should not be considered as a form of therapy, advice, direction and/or diagnosis or treatment of any kind: medical, spiritual, mental or other. If expert advice or counseling is needed, services of a competent professional should be sought. The author and the Publisher assume no responsibility or liability and specifically disclaim any warranty, express or implied for any products or services mentioned, or any techniques or practices described. The purchaser or reader of this information or how to book publication assumes responsibility for the use of these how to do Pilates materials and articles and information. 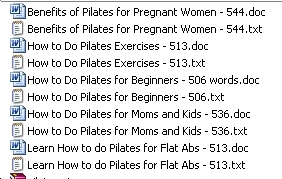 Neither how to do Pilates author, nor the Publisher, assumes any responsibility or liability whatsoever on the behalf of any purchaser or reader of these materials.